To say that No Man’s Sky had a troubled launch would be a massive understatement. Even as someone who generally had a good time with the game then, I had to admit that it was missing promised features and lacked polish. Over a year later, a lot of things have changed for the game, and all for the better. Even though I’ve always liked it, this is the first time I’d say that No Man’s Sky is an actual good game. I frequently enjoy things that aren’t “good,” like the CW’s Riverdale or Fall Out Boy’s music. The things that I like about them aren’t necessarily on purpose, and are maybe a little corny, but I find value in them. For a long time, No Man’s Sky fell into that category for me. It wasn’t delivering on the vision it promised, of unfettered exploration and discovery. It was a bit repetitive, and I felt like I’d discover more things I couldn’t do than things I could. Want to make a home on a planet? Well, you can’t build bases. Want to become an expert dogfigher? Not enough information in the heads up display to make it work. I’d go to a planet, scan for resources, discover some species, and hope that something interesting would happen before getting bored and leaving. Compared to the now infamous E3 demo, this was unremarkable, but it was really perfect for getting your buzz on and listening to podcasts. I played the vanilla No Man’s Sky for a long time, but the shine did wear off, I ran out of podcasts, and I moved on. Finally finding a planet with tufts of grass and blue skies feels so good! Returning to the game doesn’t feel wholly alien, but the changes are significant and important. This really struck me when I finally got in a dogfight in space. At launch, all aerial combat sucked. Whenever I jumped into space and got an alert that pirates were attacking my ship, I always resigned myself to death. Ships didn’t handle very well, which made aiming any weapons with the reticule and avoiding enemy fire feel impossible. Since the most recent patch, dubbed Atlas Rising, I had noticed that flight controls were more sensitive, and I could fly closer to the ground on planets. In space, when it came time to fight, I learned suddenly that I could roll right and left, that my turning radius was sharper, and when I had an enemy ship in my sights, the camera would zoom in slightly, and the ship I was aiming at would be highlighted. These are small, quality of life changes, but last night was also the first time I was able to destroy an enemy ship. Finally, combat didn’t feel like a slog. There’s also a lot of new content—like base building, vehicles and joint exploration—but what makes a difference to me is that the core features have polish. The changes to the scanner makes discovery not only more interesting, but more profitable, as scanning animals automatically adds credits to your account. You could always play as a pacifistic explorer, but now it’s less grindy and more profitable. Base building has also added farming, making trade among NPCs an actual viable tactic for making money, and giving players a chance to settle into a planet they like and stay there. The changes to how planets and animals are generated make space feel more mysterious and exciting. There’s new biomes, some of which are shockingly beautiful, and on those planets more variation in abandoned buildings or ruins or crashed freighters you can find exploring planets. You’re no longer resigned to walking around and hoping you find something, either. You can now build signal boosters, which will point you in the direction of an interesting close landmark. That’s how I found my first crashed freighter, half buried in the ground. Against my will, I found myself sighing, “wow,” when I saw it. Portals, which can send you to specific coordinates once you learn the glyphs to turn them on, also allows players to visit specific landmarks and areas of interest..Combining that with joint exploration, a basic multiplayer which allows you to speak to other players, the game now fosters community instead of forcing players apart. The people who stuck with No Man’s Sky always found ways to play with each other. 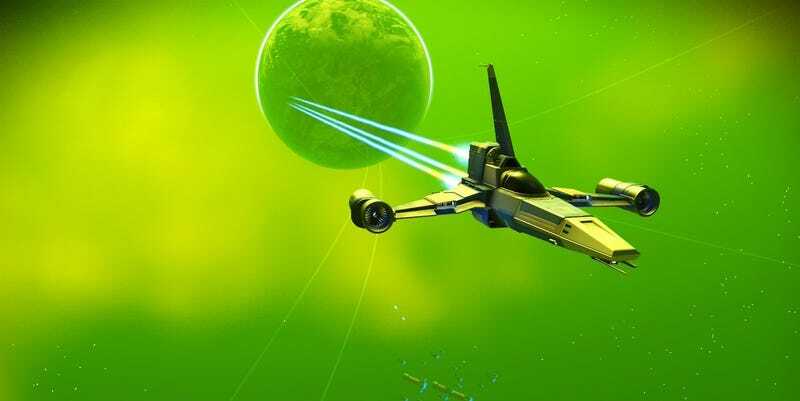 The Galactic Hub was created as a way to bring players together and share discoveries. Portals make what was once complicate much easier. You don’t have to jump through hoops or make complicated maps to find what other players have found—you can just go there, and then talk with other players about things you’ve all experienced. No Man’s Sky has always been a good idea. Exploring a vast universe and discovering the unknown was a good enough hook that hundreds of thousands of people gave it a try. Now the game has graduated from a good idea to an actual good game. It’s not just that there’s more content and more things to do. The game has been re-tooled, from the user interfaces to the dogfighting to working Portals, in order to improve players’ ability to discover interesting things, and allow them to actually feel a part of the worlds they inhabit. If you haven’t played since launch, pick it back up. If you were turned off by bad reviews, it’s time to give it a try.